These were, without doubt, the best gluten free buns we’ve had so far. The crumb was tender and not too chewy and the flavour of the cinnamon, orange zest, and fruit was out of this world. You could even make these into a great hot cross bun – instructions included in the recipe. We stored the buns in a sealed container on the counter overnight and they were still good if a bit drier on day two. For day three, we toasted what was left and they tasted great. We will certainly be making these again, and again, and again …. We replaced the rice flour with teff flour for darker colour and a smoother texture. We added a bit more sugar (3 tablespoons instead of 2) and less salt (1/2 teaspoon instead of 1) to make the buns sweeter. The recipe calls for either oil or melted butter and we used melted butter. TIP: We used a five fruit mix from Our Compliments that included blueberries, raisins, golden raisins, currents, cherries and cranberries. Soak your fruit for an hour or so if you want the buns to stay soft longer. Once mixed well, we left the dough on the counter for a couple of hours and then placed it in the fridge overnight. Heat oven to 350 degrees and grease 6 muffin cups. Divide the dough into 6 pieces. With greased hands, roll each into a rough ball and place in its own muffin cup. TIP: To make HOT CROSS BUNS, mix together 4 tablespoons all purpose gluten free flour with 1 tablespoon water. Work together with your hands until you get a nice pliable paste. Add more water by the teaspoon if needed. Now, put the paste in a pastry bag and carefully pipe your crosses onto the dough before putting in the oven. After removing the buns from the oven, brush the tops with melted honey to make the shiny and sticky. Bake for 25-30 minutes. Remove, let cool, and enjoy! 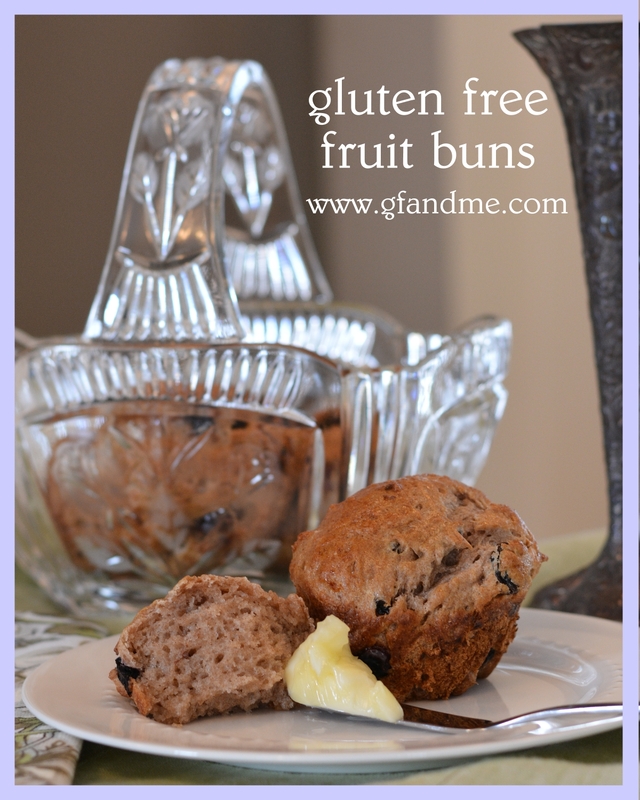 This entry was posted in Baking, Breakfast & Brunch, Recipes and tagged bread, gluten free, holidays, tapioca, teff. Bookmark the permalink. It is really, really good. Thanks for the recipe!